FENG SHUI CAN HELP PEOPLE TO BRING GOOD LUCK TO IMPROVE YOUR CAREER AND BUSINESS. MY INTENTION IS TO HELP PEOPLE BY HELPING TO CREATE GOOD FENG SHUI IN YOUR PERSONAL HOME OR BUSINESS. 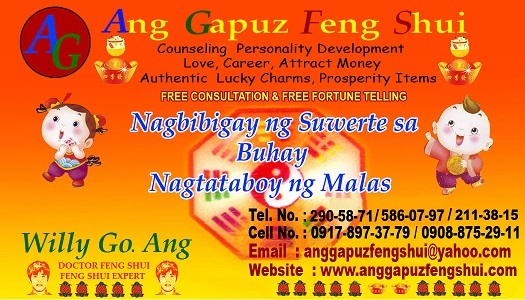 ANG GAPUZ FENG SHUI OFFER FREE FENG SHUI CONSULTATION AND FREE FENG SHUI FORTUNE TELLING PALM READING.